The beautiful Love Bridge collection by Thomas Sabo symbolises the special and unbreakable bond between two souls whether they are lovers, best friends or family. 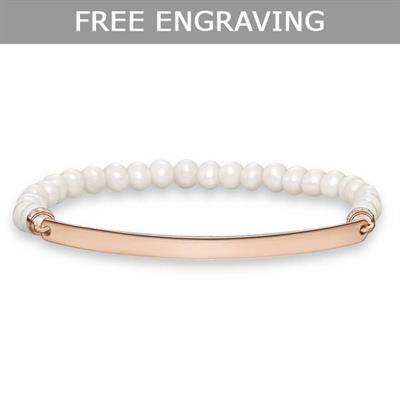 This fabulous bracelet is made with a string of cultivated freshwater pearls with a rich 18ct rose gold plated 925 sterling silver bar. This pretty combination is a fabulous way to add some elegance to a bracelet stack. Thomas Sabo Love Bridge bracelets can be engraved.